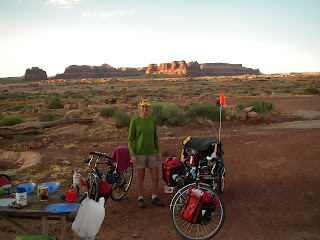 In Hanksville our best information was that we we were facing three days, two nights without reliable water sources so on Saturday before we left we loaded up with lots of heavy water, an additional 36 lbs in the trailer alone. The weather was hot and we were consuming a lot of water on our way down Hwy. 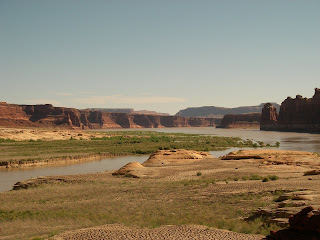 95 towards Hite at the eastern end of Lake Powell. In route we stopped at Hog Spring where water was running so we filtered enough to replace what we had already drunk. 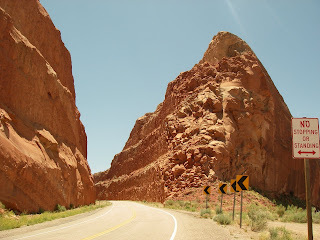 Finally we made a great descent to Lake Powell and Hite through a gap in the red rock blasted out for the road. It was a long day and we weren't sure what we would find at Hite. We had been told that due to the drought, Hite was closed and there was no water. What we found was quite different. People were using the boat ramp, the bathrooms were open, there was water, and even the store was open (though we arrived after it closed and left before it opened). Sunday, Father's Day, we faced a 45 mile gradual climb of 3000 ft. to Natural Bridges National Monument. The first part we paralleled White Canyon, which looks like a great place to explore, full of slots and verdant vegetation in the more open stretches. Not all of the climb was gradual, there were some steep pitches, and again the weather was hot. We weren't sure that we would make it all the way to the Monument, climbing the whole way heavily ladened. But in the end we set our caps for the Monument and rolled in late in the afternoon. John broke two spokes on the climb and spent a good portion of the day making road side repairs. The campground at the Monument was dry but there was good cool water at the visitors center, so we never really had a dry camp after all, though with the weather so hot we consumed a lot and didn't feel bad about carrying so much. The trip from Natural Bridges to Blanding on Monday was a net elevation loss, it was a very challenging day none the less. Early in the ride we had a fast prolonged descent on which we all set new personal best speed records for the trip. Belinda broke 42 mph, Dave 47 mph, and the speed demon John hit 48 mph. Then the road turned ugly. We crossed several washes, with a fast descent to the bottom followed by very steep climbs out. In one five mile stretch, Belinda was pulling the cart, there were four pitches so steep she was having trouble even pushing the cart up the hill. So Dave would ride to the top of a pitch, park his bike, and jog back down to help Belinda push her bike and cart to the top. It was also a day of flat tires. We had five flats between the three of us, Dave had one, Belinda and John had two flats each. At last we reached Blanding. As we have been seven straight days on the road we are taking a rest day here on Tuesday. We are doing laundry, patching inner tubes, and cleaning up the bikes. Tomorrow we will ride out of Utah on Hwy 191 to Dove Creek, Colorado! How utterly amazing! All three pictures are superb. It is better to be prepared and carry too much water, but all that work, ouch. Wonderful to see those beloved canned veggies on the table, but what the heck are those new-fangled blue plastic thingies? We never had that kinda stuff in my day. Surprising to hear about all the "mechanicals," multiple broken spokes and tires in ONE DAY? Speed demons! Almost touching 50 mph, sounds like you're trying to get out of this thing before its properly finished! As you mentioned, it is hard to imagine people carving a life out of that area in ancient times, but pity the engineers and workers who ACTUALLY carved out that gorge. Good luck to all of you. Mark, those new fangled blue thingies are foldable bowls (like origami). They work great and unfold to pack flat and are light in weight to boot. Friends gave them to us at Christmas time along with a couple of sporks that we love as well. After reading your blog I feel guilty telling you what a great time I had picking ollalieberries yesterday and later making jam and a mouthwatering cobbler but I figure you might enjoy hearing simple stories from home. Sounds like it has been a bit challenging (albeit gorgeous)in those parts of Utah. We have travelled through Utah and remember areas that looked "unearthly" for sure. Dave...we really miss you...it's cluster counting time in the vineyards.